Welcome to the yummy world of Piadina! Piadina is where I want to live, well actually it isn’t a place (not that I know of anyway), but to me it is a fluffy little island that I forever want to live on or at very least eat everything off of! 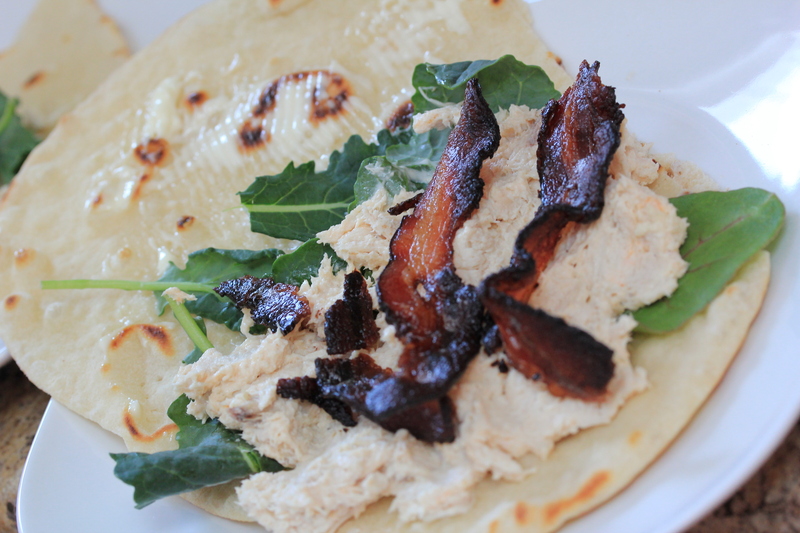 Piadina is a soft, fluffy little Italian flatbread made with lard, I said it LARD! Mmmm. I first tasted a yummy morsel like this many, many moons ago. It was light and fluffy and it was filled with a caesar salad. Ever since then I have been searching for that flavor I had no idea what it was, I figured it was an Indian style flatbread. The hubs was bored and since no plain old chicken salad sandwich will do at our house, he whipped out “I’m going to make Piadina!” five minutes before the lunchtime hunger melt down. I had no idea what he was talking about so I rolled my eyes knowing that the wrath of hungry littles was about to pound on him like a sledge hammer carnival game. Good luck, I thought. But alas, Dad is way more fun than Mom, so he was able to keep the natives at bay. I let him do his thing and stayed out of the way until I smelled the fluffy goodness in the pan! OH MY WORD! It was heavenly! Not in a brownie out of the oven heavenly way, but in a salty, bacon-ish angels calling sort of way. I know, you are thinking “it’s just bread lady!” but it is ohhhh, so much more. I ran over to the stove, I may have “accidentally” pushed one of the kids out of the way, tore a piece off the bread, shoved it into my mouth and I was taken back to that silly salad-wich that I had tasted years ago int he midwest! You must try this, it doesn’t take long to make and its flavor is amazing. I am very much on a sprouted what kick lately, but I ran out of the sprouted wheat flour. Boo…So I vow to make this with sprouted wheat and see if there is a difference. The recipe credit belongs here, to Food52 Blog and to her Nonna! Thank you Nonna, no chicken salad sandwich will ever compare. Place flour in a mound on pastry board or counter. Sprinkle on salt and baking powder, and mix together with your fingers. Make a well in the center. Drop in the shortening and rub it together with the flour using your fingertips. Lumps are okay! And it will still be pretty floury. Make a well again and pour in water and milk. Mix with fingers until dough comes together. Add a little more warm water or flour, if needed. You want a soft dough  not at all sticky. Knead for a couple minutes, and roll into a log shape. Alternatively, all the mixing can be done in a large bowl. I like to use a fork to mix everything together. Divide the dough into 6 equal pieces, using a scale if you have one. With one hand, gently roll each piece on the board/counter into a ball. Mom says to use your thumb and nudge the dough ball under with each turn. Set each ball to the side on a sprinkling of flour and let rest for 5 minutes. Heat griddle to medium. Slightly flatten a ball and roll out dough to about 9 inches in diameter. Gently lift and place on hot griddle, scoring the piadina all over with the tines of a fork. If bubbles appear, quickly pierce those suckers with the fork. Cook each side for a few minutes or until each side develops some lightly browned spots. Remove to a clean dish cloth. Repeat with each ball, and stack each cooked piadina over one another. Loosely cover with a dish towel. When done, cut piadine into quarters and enjoy with your favorite sandwich fixings. Piadina freezes well. Reheat on a griddle.